A school fundraising drive led by two inspirational students who lost their fathers to cancer has raised a record-breaking £15,397 for the local hospice which cared for both men while also supporting their families. Pupils at Ripon Grammar School threw themselves into raising the staggering amount for Saint Michael’s Hospice in Harrogate during the school’s Charity Week, with events including dance battles, a staff rock band concert, sumo wrestling and a pantomime. The whole school rallied behind the campaign, with history teacher David Bruce running his first marathon to add £1,000 to the total and fourth former Ella Foster completing ten 10K runs to raise another £1,500. Students from all year groups ran stalls, sixth formers organised a charity ball and pupils in one form raised £390 by swimming more than the distance of a marathon – 2,131 lengths – in the school pool during their lunch hour. Louise Taylor, 17, and Grace Withyman, 16, initiated the fundraising campaign when they presented a moving assembly to the whole school, explaining how the hospice, which needs to raise £5m annually, had helped them. After urging their fellow pupils to support this worthy cause, the two sixth form students were overwhelmed by just how much everyone took the appeal to their hearts. Grace, from Ripon, whose father Jim, a barrister, died aged 49 in 2017, said she was delighted at how much the school had raised. “It’s such an amazing cause. This charity is so important, as I think all families should have the same support on offer if they need it, as I know from first-hand experience that it makes the world of difference when you’re losing your loved one,” she said. She said staff at the hospice had helped her whole family when her father Chris, a builder, died aged 54: “I know our fundraising will make such a difference to so many people’s lives,” she said. Louise added that she was pleased to have helped make the rest of the school more aware of the great work Saint Michael’s does, following a visit to the hospice by school officers. Chief executive of Saint Michael’s Hospice, Tony Collins described the amount raised by Ripon Grammar School - the largest amount ever raised by one school fundraising event for the hospice - as remarkable and inspiring. 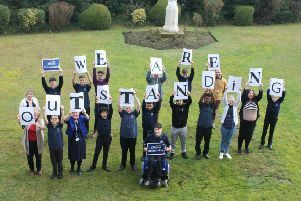 “We would like to extend a sincere thank you to all the pupils, staff and parents for their enthusiasm and generosity for choosing to support us in this way,” he said. “We would also like to congratulate the school for its success in raising their record-breaking total. “This truly impressive donation of £15,300 will be put to immediate use, helping us ensure that local people living with a terminal illness and their families can make the most of precious time together,” he added. Students at RGS raise around £10,000 every year for a chosen charity, but this one has been the best yet, said Louise: “It was the most successful charity week in my seven years at RGS, not only in the sum of money raised but in the general awareness of the reasons behind the fundraising efforts.